A new way of working and a first for practical BIM. either working standalone or as part of a connected project team. One platform to connect your entire building . BuildingWorks is a seamlessly integrated practical BIM software suite to design, evaluate the energy performance and estimate the cost of residential new build homes, extensions, conversions and property refurbishment. See the immediate impact of your design and specification decisions on project cost and energy performance. The ultimate in construction optioneering. The business benefits are endless. Project data can be easily shared across multidisciplinary teams – even if the team is just one person supercharged with an incredibly powerful software tool! Please check the modules you are interested in for specific features by checking out the Pricing page and features tables. 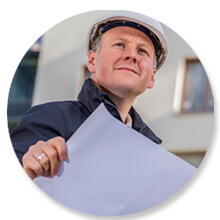 BuildingWorks will help you cost up your building projects (take-off from a PDF or generate the plan yourself), help you review the specification to get the cost/energy performance balance right, get your company and projects covered health & safety wise (before you start work! ), keep the project on track – oh and get paid! Running a development firm is a complex and expensive business, and BuildingWorks helps derisk things. Draft planning application and working drawings for your scheme, cost the development instantly, review the spec' to get the cost/energy performance balance right, analyse your anticipated profit and cashflow, manage the project and get health & safety compliant (before you start work!) all within one connected solution. 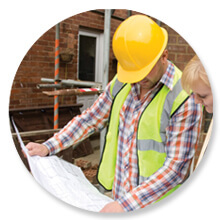 BuildingWorks helps house builders from concept to completion with their schemes. 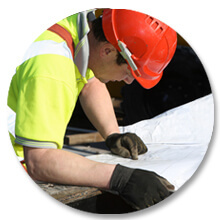 Draft planning application drawings, get the development priced up in detail, review the specification and comply with SAP, produce profit and cashflow reports, working drawings, project management Gantt charts and schedules of labour, materials and plant AND ensure CDM 2015 compliance. All within one truly integrated interface that the entire project team can share. BuildingWorks empowers you to straightforwardly and professionally produce sketch schemes, building plans and impressive 3D visualisations for domestic works in much less time than "traditional CAD" solutions. Quality plans and architectural detailing can be easily achieved. Suitable for planning applications and working drawings. 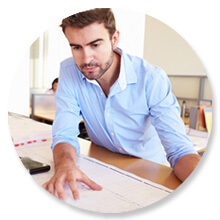 Optimise your designs with instant cost and energy performance feedback.